The optical system features a construction of 8 groups and 10 elements, including 1 ED lens element. 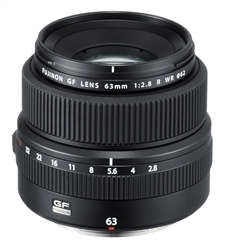 This lens type was adopted to represent the most suitable lens for the GFX 50S body’s compact size, with the utmost priority placed on resolution performance. By adopting a front group extension type for the focus method, aberration variations due to shooting distance are suppressed, achieving high resolution performance even when wide open, all the way from the center to the edges of the lens.